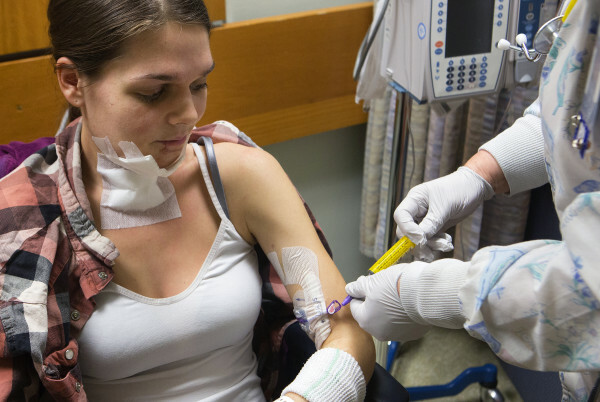 Hannah Somers-Jones sits while her treatment takes place at Eastern Maine Medical Center in Bangor Wednesday. Somers-Jones, an accomplished flute player and MDI native, was badly injured in a Nov. 22 accident in Mattawamkeag. 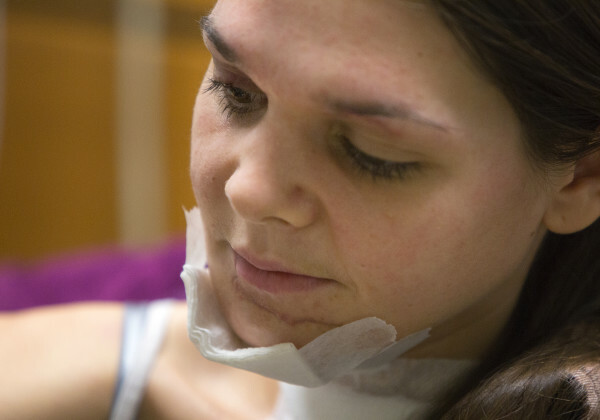 She is facing a long road to recovery but, despite severe injuries to her face, is aiming to play the flute again. Hannah Somers-Jones watches as registered nurse Kathryn Moran flushes her port after treatment at Eastern Maine Medical Center in Bangor Wednesday. Somers-Jones, an accomplished flute player and MDI native, was badly injured in a Nov. 22 accident in Mattawamkeag. She is facing a long road to recovery but, despite severe injuries to her face, is aiming to play the flute again. 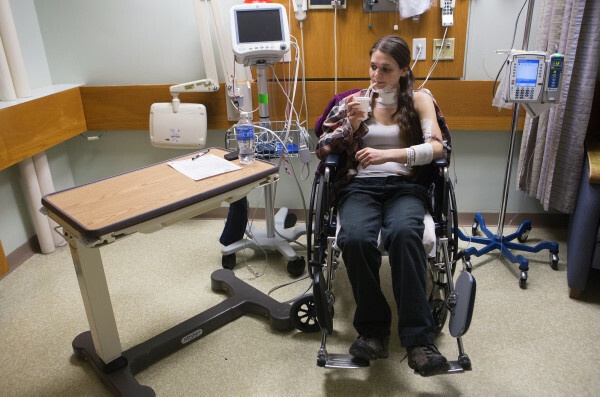 Hannah Somers-Jones sits while her treatment happens at Eastern Maine Medical Center in Bangor Wednesday. Somers-Jones, an accomplished flute player and MDI native, was badly injured in a Nov. 22 accident in Mattawamkeag. She is facing a long road to recovery but, despite severe injuries to her face, is aiming to play the flute again. Even though she was sitting in the back seat and wearing a seatbelt, Hannah Somers-Jones suffered serious facial and spinal injuries when a 2006 Subaru Legacy she was riding in went off Route 157 in Mattawamkeag on Sunday, Nov. 22. Somers-Jones, an accomplished flutist, faces a long recovery before she can resume playing her chosen instrument. 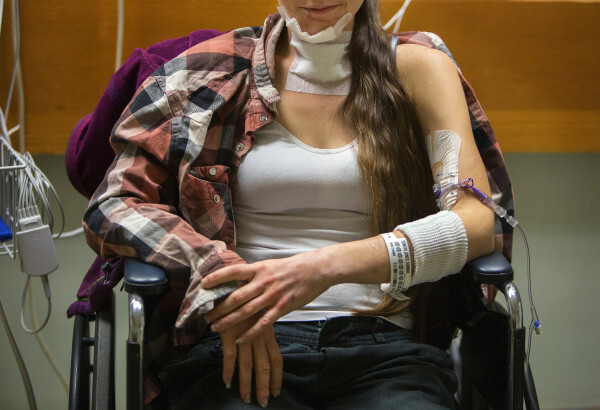 BANGOR, Maine — Hannah Somers-Jones could have died, and she knows it. She still can’t remember much about what happened on Nov. 22, when the car she was in went off Route 157 in Mattawamkeag, rolling several times before striking trees in a roadside ditch. She remembers little about the days after the accident, too, when she was kept in an induced coma at Eastern Maine Medical Center to try to help her body recover. It is probably just as well, given the injuries she suffered. 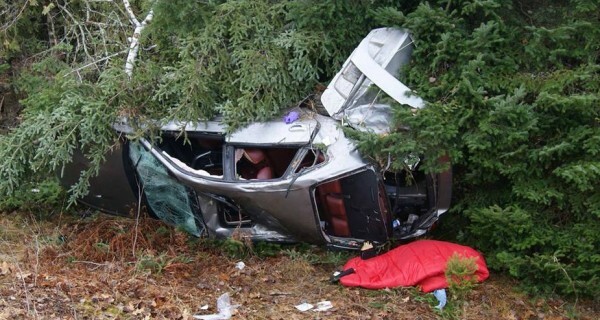 She was wearing a seat belt in the back seat, but her jaw was broken, several teeth were knocked out, and both eye sockets and vertebrae in her back were fractured. The Bar Harbor native, 27, was released from the hospital earlier this month, but still faces a long road of rehabilitation. Despite her injuries, she is confident she will resume playing her chosen instrument, though she does not know when. Kyle Jones, Hannah’s father, said her positive outlook since the accident “makes me a proud man.” He wants her to recover and heal quickly, he said, so she can resume her musical career. “She’s not mad about anything,” he said with amazement. A lawyer and former state legislator, Jones said music is important to his daughter and their relationship. Playing flute has been a central part of her life since she was in third grade, and now Jones plays with Hannah — bass to her flute — in the jazz trio 3 SQRLS, which also includes her boyfriend Grady Markie on drums. Jones said his daughter has performed at Lincoln Center in New York City and has played “basically with every [musician] in Maine.” His daughter is “great” on the flute, a loving person and a self-sufficient, independent woman, he said. Besides playing in her dad’s jazz trio, Somers-Jones also played with the Bangor-based jam band MudSeason. According to her father, renowned musicians she has performed with include composer and conductor Carman Moore, saxophonist and flutist Premik Russell Tubbs, pianist Steve Hunt, pianist J. Eric Johnson, violinist Charles Burnham and percussionist Eli Fountain Jr.
Jeff Kaliss, a Bar Harbor native and an entertainment and culture writer in San Francisco, said Monday that he has seen Somers-Jones perform and heard recordings on which she plays. She is a gifted musician, he said, adroit both at reading music and at improvisation. Bangor musicians Bernie “Flash” Kellish and Shannon Denbow, who helped organize a Friday fundraiser for Somers-Jones, said she’s known as “Hannah Hugs” for the joyful greetings she gives friends. That enthusiasm, they said, extends to her music, her fellow musicians and her audiences. Somers-Jones said regardless of when she plays the flute again, she plans to take the time to return the “overwhelming” amount of love she has felt since the car crash to the friends and relatives who have shown it to her. Like many musicians whose income comes from performing or playing at recording sessions, Somers-Jones lacks health insurance. Her friends and family have pulled together to raise funds to help bridge the financial gap. Her sister Maiysha Somers-Jones started a fundraising account at GoFundMe.com, and friends also organized a benefit concert and silent auction at the Union Street Brick Church in Bangor. Somers-Jones can talk, despite having a jaw in “a bunch of little pieces,” because of two sets of slender wires that doctors embedded separately through her upper and lower jaws, but cannot feel her lips. 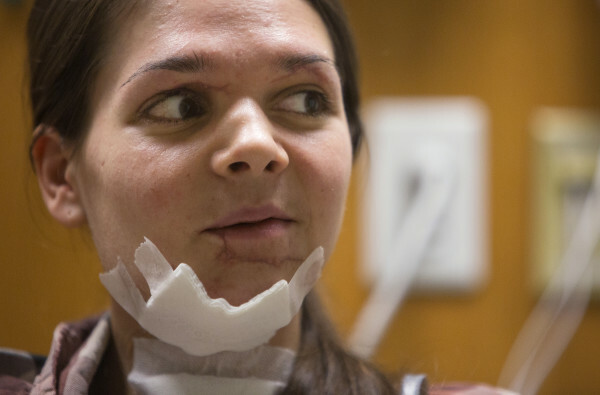 Her voice has a lisp, and her facial wounds from the accident were “dirty” when she was pulled from the car. She has been battling infections in her jaw ever since. She had 26 stitches into her eyelid and 43 staples in her back from emergency spinal surgery, all of which have since been removed. Titanium rods implanted in her back allow her to walk on her own without having to wear a brace, though she does so gingerly to avoid aggravating her body’s ample aches and pains. Her boyfriend Grady Markie, who was riding in the front passenger seat, and his brother Duncan Markie, who was driving, suffered comparatively minor injuries in the accident. Both used their military training, she said, to help her from the car without making her injuries worse. Since being released from the hospital, her boyfriend has been acting as her nurse at the home they share, helping her to wash herself and making a steady supply of smoothies until she can resume eating solid food. Maine State Police said Duncan Markie told them he swerved off the road to avoid colliding with an oncoming red minivan that had crossed the centerline into his lane. Police indicated they were hoping to talk to witnesses or anyone with information about the accident to see if they could find out more. While Somers-Jones thinks someone should be held accountable for causing the accident, she is focused on “the little things” in her recovery and staying positive.